Have you ever looked in the mirror and said to yourself, “I am Batman!” in a raspy voice? Have you ever thrown a towel around your neck and pretended to be the Caped Crusader, defending your home from super villains? Don't worry. You're not the only one! Everyone wants to be Batman, even the people who won't admit it. He's got all the coolest gadgets, all the coolest fighting moves, all the coolest friends and he even has his own personal butler that helps him fight crime. 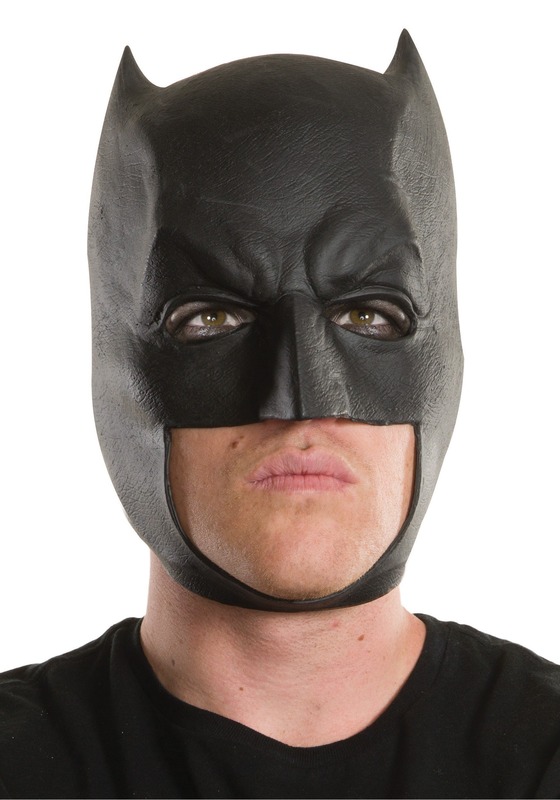 We've found the perfect thing to make you feel a little more like DC comics' Dark Knight when you look in the mirror! This Dawn of Justice ¾ Batman Mask brings you the authentic superhero look from Zack Snyder's Batman v Superman movie. With molded details that replicate the furrowed brow and pointed bat ears, this licensed mask might even have you ready to replace Ben Affleck in the next Batman movie. It pairs well with any of our other accessories based on the movie for a quick and easy way to take your first steps into the superhero game. Just remember that you may want to hold off on challenging Superman to a brawl until you have a little bit of hero experience under your utility belt!